What is it about about extreme weather and being trapped at home that makes you crave rich yummy food, like BBQ ribs? 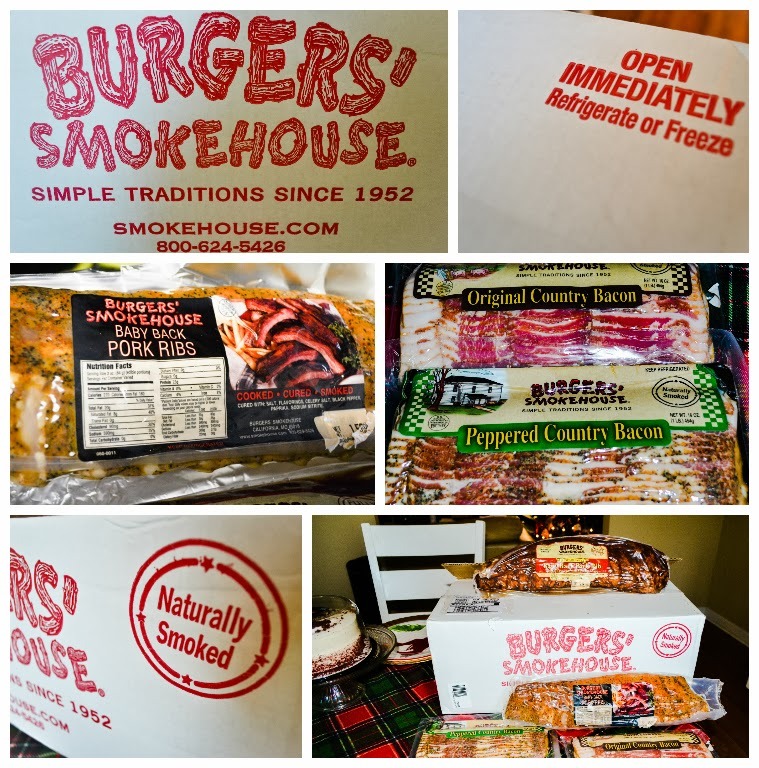 Our friends at Burger's smokehouse sent us a box with some of their top sellers products to try at home. I have to say that the first thing that surprised me was the delivery. I found the box in front of my door at 7am, so either I got a late delivery or a very early one. Thank goodness it was freezing outside and all the meats were covered with gel icepacks. Established in 1952, Burger's Smokehouse offers various hickory smoked meat products. 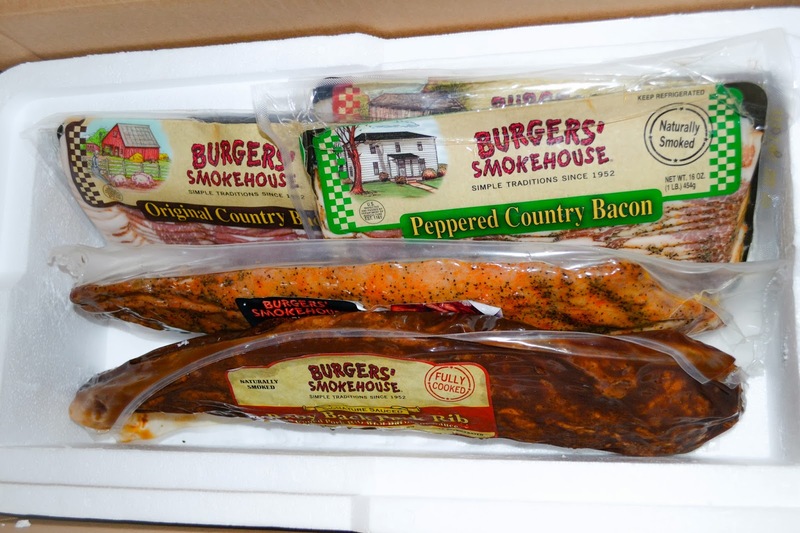 The company offers a variety of items, such as country butter samplers, smoked beef jerky, Ozark barbecue sauce trio, biscuit mix, frozen frogs legs, baked beans, sausage and cheese gift boxes, iron skillet and serrated steak knives. It additionally offers products, such as meat lover gift sets, crab cakes, baby Swiss cheese, country preserves variety packs, wooden cheese boards peanuts and twice-baked potatoes. The company also makes polish kielbasa sausage, and Italian prosciutto rotola. Its product inventory also includes items, such as breakfast sausages, Canadian bacon, chicken, desserts and sweets, fish and seafood, game birds, pork chops and roasts, ribs, samplers and variety packs, seasonings, snacks, steaks and burgers, and boneless, smoked and fresh turkey. 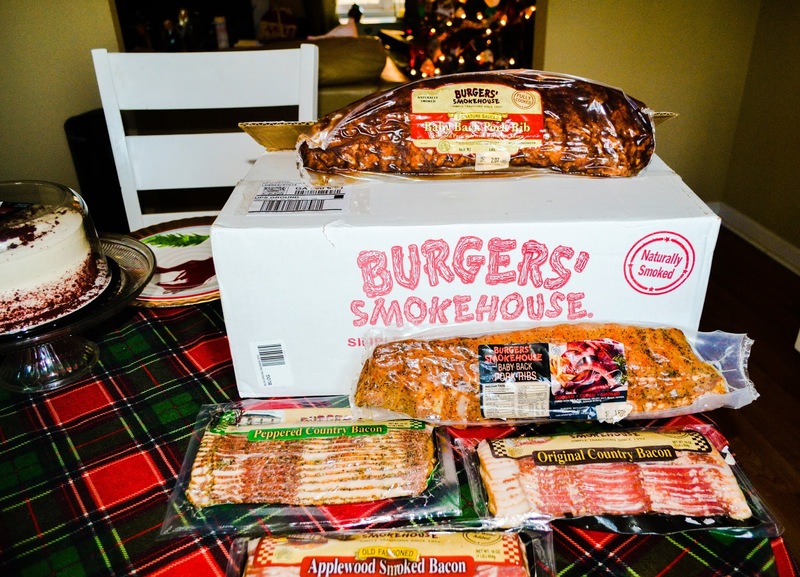 Burger's Smokehouse is one of the largest processors of naturally cured hams in the U.S. The family owned business smokes and cures chickens, turkeys and other meats the "old-fashioned way" and sells "naturally aged" hams. 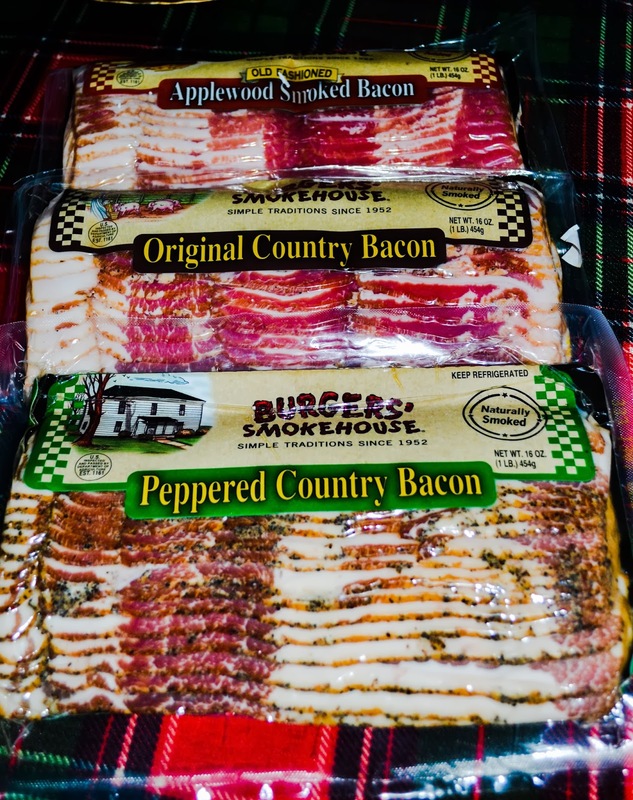 Products include original "country" bacon, peppered country bacon and brown sugar cured "country" ham. My favorite products are the Country Peppered Bacon and their Signatured Sauced Baby Back Ribs. The pepper bacon is just delicious and I just love the mouth-watering burst of peppery pork flavor. The Country Peppered Bacon cut is not to thin or too thick, and it does not shrink a lot when cooking. This bacon is perfect for BLT, burgers, and just about anything else you can imagine. Everything tastes better with bacon, that is if you are using the right one. Burger's Smokehouse also have a line of fully cooked ribs that are dynamite. When I noticed that they were fully cooked my first reaction was that they were going to get chewy and hard after I take them out of the oven, but boy was I wrong. The meat melts in your mouth like butter. 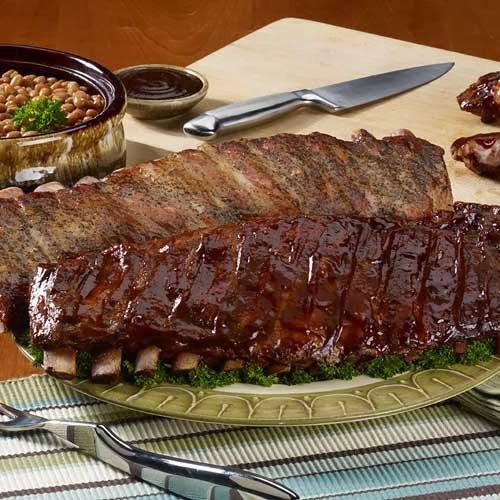 The ribs are tender, moist, juicy and flavorful, and the meat fall of the bone easily. The sauce is well balanced with just the right amount of acid and sweetness. We served them during our Christmas dinner and everyone was fighting over them. They are that good! Burger's Smokehouse currently having an after Christmas sale. If you spend $50 to $100 and they will automatically send along with your order a free one 8 oz. pkg of Biscuit Size Country Ham. SPEND $100 or more and we will automatically send along with your order FREE: One 8 oz. pkg. of Biscuit Size Country Ham and One 1 lb. package of our Country Cajun Bacon (nom, nom). Free gift must ship with your order to the same address by Feb. 5, 2014. Purchase of Gift Certificates are excluded. Check out Burgers' Smokehouse on Facebook, you might get a chance to win a gift card to sample some of their products. Also don't forget to follow them on Twitter, and find great tips on Pinterest, and YouTube. *Disclosure: Per FTC Regulations, I am disclosing that I received product(s) from this company/website, free of charge, for review. I was in no other way compensated for my review. The views expressed in this review are my own, honest opinions and any claims should be verified on the sponsor's site.